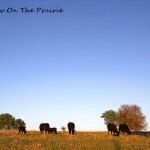 We went to the pasture over the weekend to check on the cattle. We saw most of the herd on a distant hill, but none close by. We got out of the truck, and while I was fiddling with my camera, Harland announced in his mock ominous tone, “We’re not alone”. 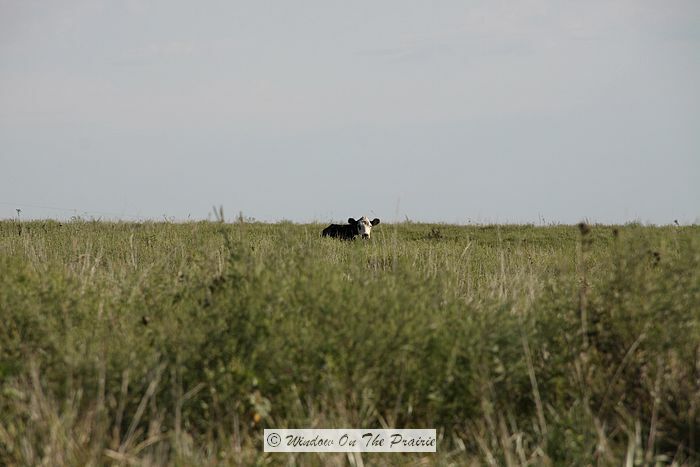 A lone cow peered at us over the rim of a nearby hill. Soon, she was joined by her companions: another cow and three calves. 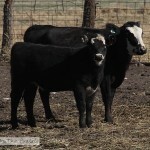 I hadn’t seen the calves in a while, and was impressed with how much they’ve grown. 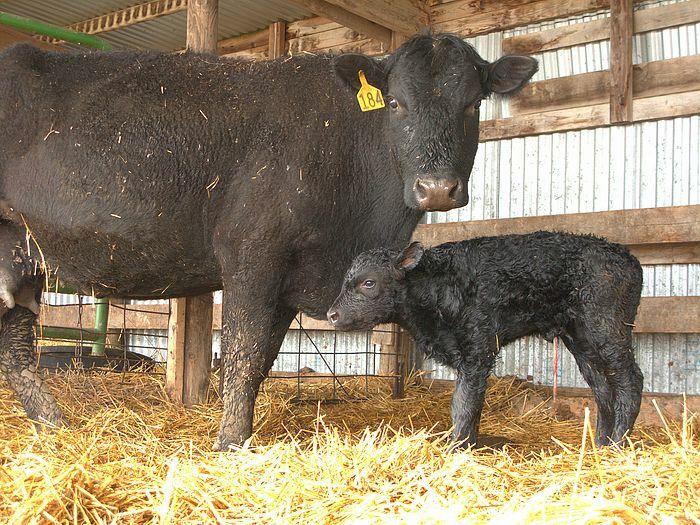 Most of our calves were born in March, and back then, they were relatively small, weighing from 70 to 80 pounds. By late June, they had more than doubled in size, and weighed about 200 pounds. 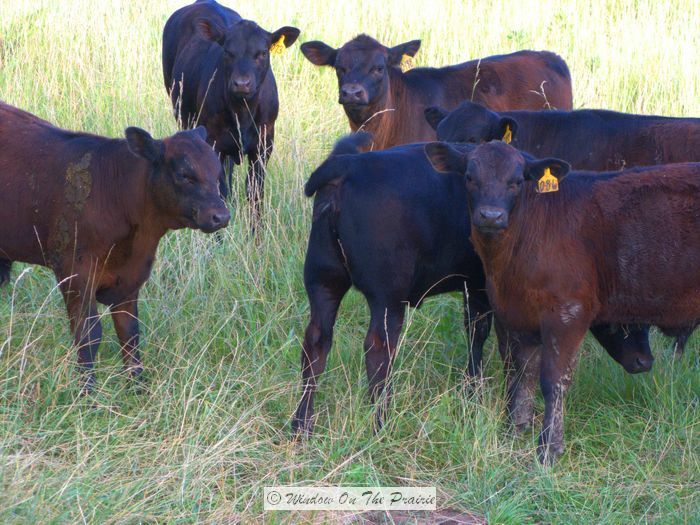 Summer has been good for the calves. Between the good pasture grass and their mama’s milk, they now weigh about 500 pounds. 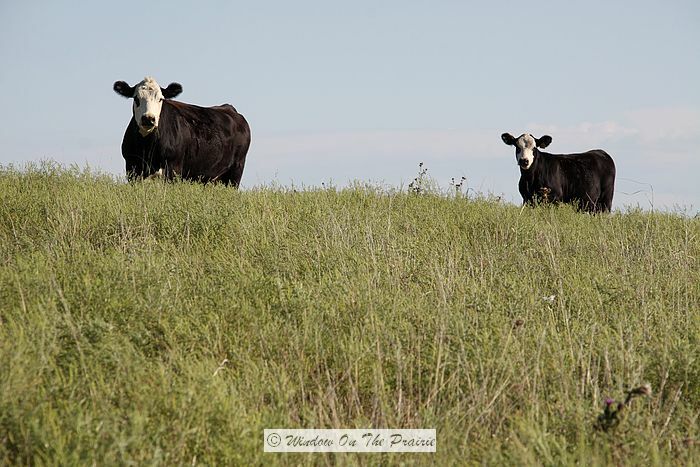 The cattle will stay out on the summer pasture until round up in early November. Until then, the calves will continue to eat grass, milk from their mamas, and grow even more. 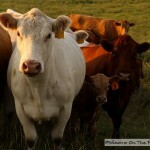 For more posts about the cattle, click here, and scroll down. ——>Up Next: What is located in a town with a population of 9, but attracts 75,000 visitors over a 3 day period? The Sparks, Kansas Antique and Collectibles Flea Market. Let’s go shopping! I am so tickled to have found your blog, I love your photos. I grew up on a very very small farm, 15 acres, but I had cows and was in 4H and I LOVED everything about having land around you. We had barn cats, house cats, chickens, rabbits, a turkey, etc. The usual trappings of a small farm. Now I’m just thrilled to have a yard and neighbors who can’t see into my house! Welcome! I too grew up on small acreage – only 3 acres, but we had dogs, cats, a horse and calves too. 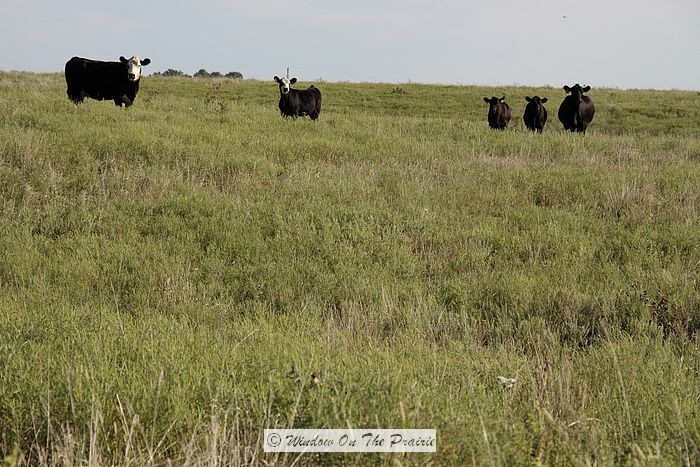 The cattle are at the summer pasture now which is about 200 acres. We check up on them every week. Somehow they know which are the bad weeds and don’t eat them. Even though it is pretty remote there, they are pretty self sufficient and can take care of themselves so we don’t worry about them much there. Hi Suzanne! 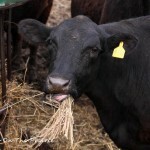 Love your cattle photos. I laughed when you said Harland said “We’re not alone.” I love how you can just see the top of the cow’s head! 200 acres…WOW! that’s a lot of space for them to roam! So..every cow eventually goes to market right?? Oh..and then do you sell all that meat to a company, and then that company butchers them and then sells to the grocery stores?? or is the butcher just the middle man..As you can see I’m a little clueless. 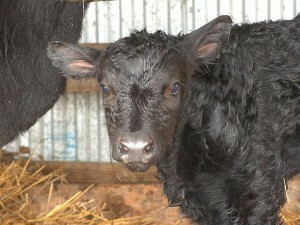 We keep the cows (mamas), but the calves we sell every year. 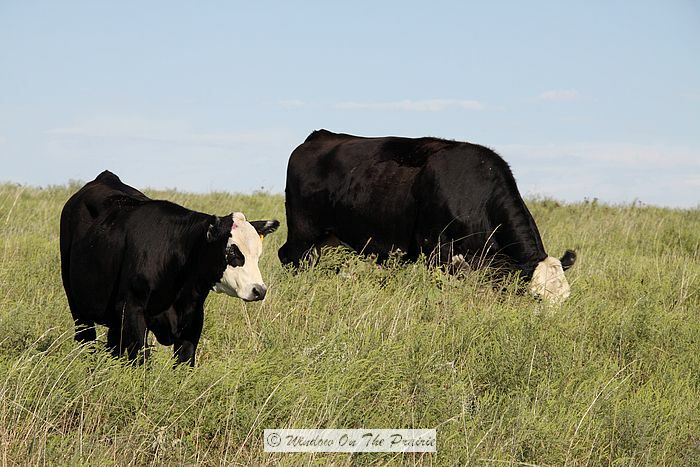 The calves born this March will be sold in January 2011 at auction, and the buyer will feed them up on grain for 90 days (for good beef marbling), and then they will go to a packing plant and um…well…you know, they’ll end up in the grocery store. 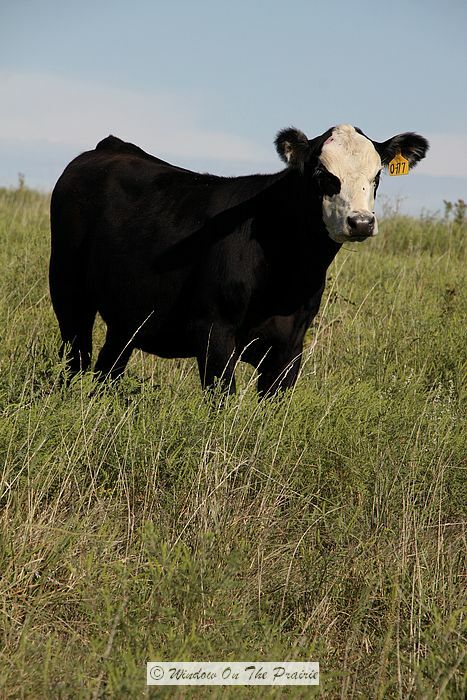 Our cattle operation is what is known as a Cow/calf operation. 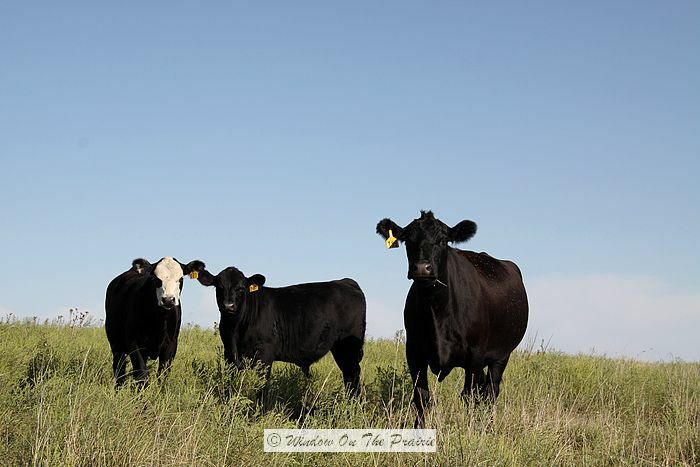 We raise cattle for the calves they have, and then sell the calves every year. Oh my goodness! They really look good! they are so curious. I took some pics of baby caves this past spring.Not as good as yours though. They are really adorable when born, and kinda fearless too. Their moms teach them to be afraid and cautious about people. They are looking good! It’s amazing how quickly they grow up and how big they are when they are still nursing! I’m always impressed with how fast they grow every year. We wean them in November when they are about 8 months old. Howdy from another Kansas blogger! Saw ya in the comments at TK and I’ll click on anyone’s sig that mentions the prairie. Great stuff! Took a quick peek at your site, and will be back for more. Love the clean look of it. They look cute with their ear adornments! I wonder what information is recorded on those tags. The numbers on the calf’s eartags represent the year they were born, and the number of their mother. Everybody gets a number so we can keep track of who’s who. 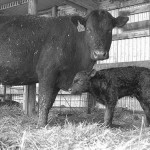 Mama’s milk has a high fat content, and really gets them off to a good start. So cute! I love cows! Thanks for visiting City Girl. walking among those wonderful looking cows and calves. takes a human lots of years? Interesting thought!! Shorter life expectancy too. They only live about a dozen years. Geez, Suzanne your right!!! Hadn’t thought of that. Bummer. Suzanne, thank you so much for answering my questions about cattle. Seriously!! because I really didn’t know…so now it makes total sense and I get it! I like to understand these things because I think it’s interesting! That’s one of the reasons why I love your blog. You explain some of the workings of a farm….for instance…your hay baling post…I loved it…I’ve seen plenty of bales all over Pennsylvania as you can imagine, but…I’ve never seen it done…and now, thanks to you, I “get it” now! 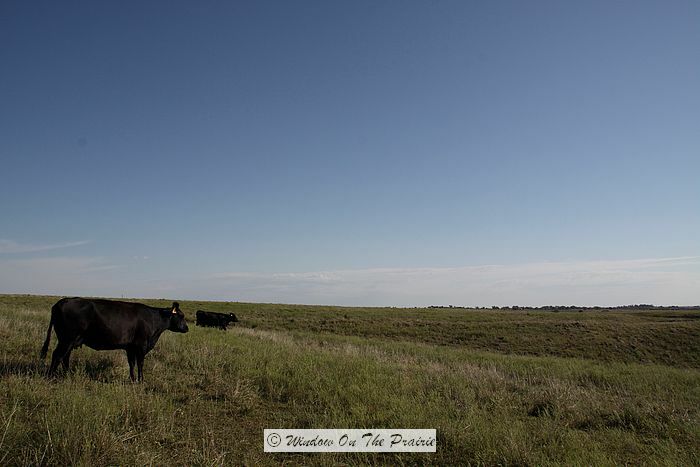 I enjoy answering all the questions because part of the reason I started this blog was to show everyone what it is like to farm.